By the time we have trudged up and down our lawns over a cold wet winter, our lawns can look a little bit bare.These patches can easily be repaired in Spring or Autumn if your lawn has had a hard summer. 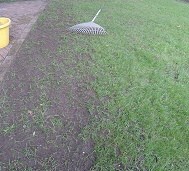 One of the many questions that is asked about sowing grass seed is “Does the seed need to be covered?”. The answer is YES. If the grass seed is just sprinkled on the already hardened bare patch, it will have little chance of germinating. Give it a good start by mixing some grass seed in a bucket of cheap potting compost. Rake the area first, it helps to break up the soil pan (the hard capping that forms on soil with compaction). It is important that the seed has good contact with the soil so remove any light debris too. 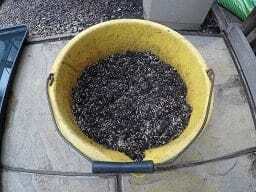 Sprinkle your bucket of grass seed/compost mix over the bare patches. A bucket full, will cover quite an area. Water in with a watering can or hosepipe with a fine rose. The mix needs to be kept damp not soaking wet, so if using a sprinkler don’t leave it on too long, otherwise puddles form and the seed floats and doesn’t get the good contact with the soil/compost that it requires to germinate. Grass seed will germinate over about 9⁰C. Don’t worry about the cold nights the soil will warm throughout the day and the seed will be quite happy. Expect germination in about 10-14 days at this temperature. And 5 days at a day time temperature of 16⁰C and above. 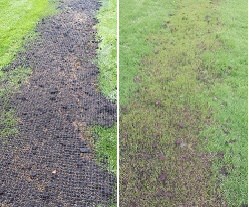 You can also use this method for repairing areas where moss has been removed or weeds have died off. 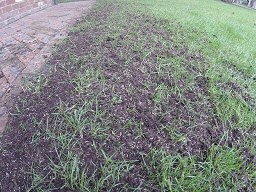 Which Grass Seed should I use? Any Multipurpose grass seed is great for the job, as is “all in one patch repair” bottles which contain both a coir based growing agent (an artificial compost) and grass seed ready to go. Although there are a few people who have been unsuccessful with this Four Day Grass Seed. This has not been our experience in The Perfect Garden using our potting compost method. The two pictures below are “before and after”. The grass did germinate as promised dead on four days.